Going back the second time and doing my Deathwing process over again, I was able to clean up my act and add a little control to what I was doing with my washes. I think that's one of the biggest things people learn to do with the GW washes, figure out "how" to apply them and not just throw them on the model. That being said, I think this guy looks a bit more professional and not like an accident when it comes to the painting. He does come with two different kinds of bases. 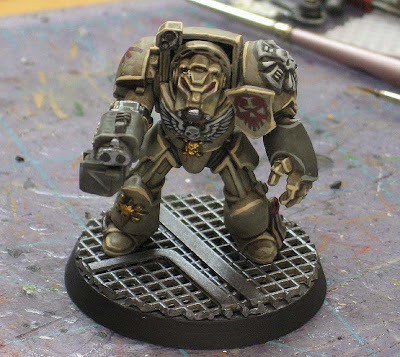 My Client asked me to do the regular textured base and then to build one that was similar to the Space Hulk decking I did once before with my Space Hulk models. Not being sure how it would turn out on a round base, I gave it a go to see what the results would be. I think it turned out alright. It's nothing more than a piece of plastic that is used for knitting (or something like that) that has the perfect sized grid to it. I cut out a small piece of the material and glued it to the top of my round 40mm base. In this case, I used superglue for a temporary hold. If I were going to do it again for keeps, I'd use plastic glue because the grid material pops off too easy with just superglue. Once it was glued in place, I flipped the base over and trimmed away the excess from the edge. I made sure to hold my blade at an angle to continue the bevel along the edge. A few strips of plasticard across the top to break up the surface texture and it was ready for paint. I really like the look of the metal decking. Of course there are lots of resin bases out there you can buy that have much better results, but if you were looking for a tabletop quality alternative, this would certainly work for me. The knitting mesh is fantastic stuff - I discovered it a while back through my wife and have been using it for basing since. (@Australian readers -- this stuff can be purchased at any Lincraft store). aka "Granny grate". You can get it anywhere there are blue haired, sweet old ladies. 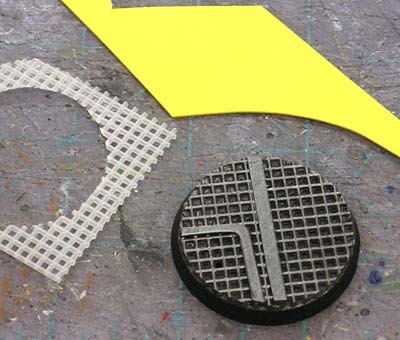 "Of course there are lots of resin bases out there you can buy that have much better results, but if you were looking for a tabletop quality alternative, this would certainly work for me." I completely think you are selling yourself short here. That looks fantastic. Easily as good as any resin base. Well done! jabberjabber: thanks for the tip on where to buy it. I try to be as descriptive as possible in my posts (as you can tell). Elbrun: If I were shortchanged on comp (no flock) because of this, I don't think I would go back and play again. Independent Characters: Thanks, but I've seen some of th resin stuff out there, this isn't even close. 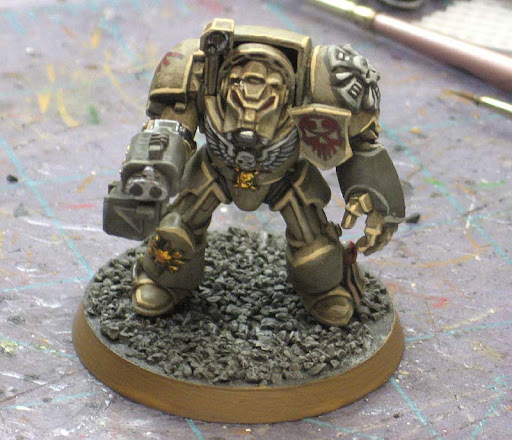 Basement Gaming Bunker: I'm not too fond of the super clean GW look to the models either. The shadows just don't "match" for me.